Reading and share top 8 famous quotes and sayings about Desert Beauty by famous authors and people. Browse top 8 famous quotes and sayings about Desert Beauty by most favorite authors. 1. "Heaven and earth. Our reason has driven all away. Alone at last, we end up by ruling over a desert. What imagination could we have left for that higher equilibrium in which nature balanced history, beauty, virtue, and which applied the music of numbers even to blood-tragedy? 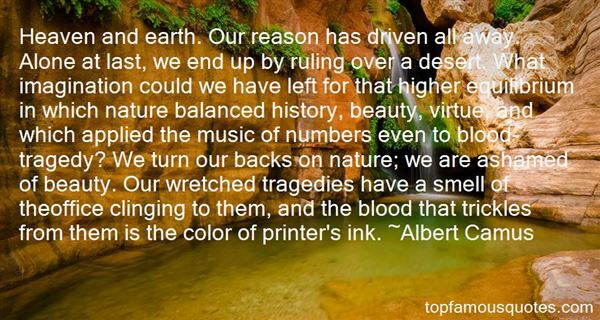 We turn our backs on nature; we are ashamed of beauty. Our wretched tragedies have a smell of theoffice clinging to them, and the blood that trickles from them is the color of printer's ink." 2. 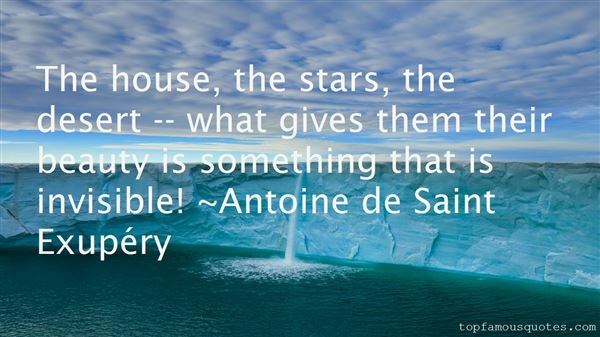 "The house, the stars, the desert -- what gives them their beauty is something that is invisible!" 3. "Imaginings and resonances and pain and small longings and prejudices. They mean nothing against the resolute hardness of the sea. They meant less than the marl and the mud and the dry clay of the cliff that were eaten away by the weather, washed away by the sea. It was not just that they would fade: they hardly existed, they did not matter, they would have no impact on this cold dawn, this deserted remote seascape where the water shone in the early light and shocked her with its sullen beauty. It might have been better, she felt, if there had never been people, if this turning of the world, and the glistening sea, and the morning breeze happened without witnesses, without anyone feeling, or remembering, or dying, or trying to love. 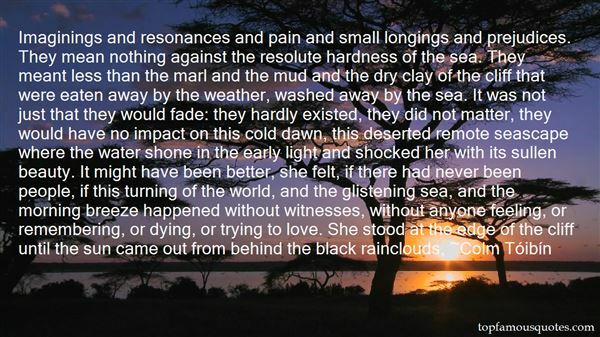 She stood at the edge of the cliff until the sun came out from behind the black rainclouds,"
4. "I'd forgotten how enlivening it could feel, seeing clearly and far. Aridity frees light. It also unleashes grandeur. The earth here wasn't cloaked in forest, nor draped in green. Green was pastoral, peaceful, mild. Desert beauty was "sublime" in the way that the romantic poets had used the word- not peaceful dales but rugged mountain faces, not reassuring but daunting nature, the earth's skin and haunches, its spines and angles arching prehistorically in sunlight." 5. "Spring advanced rapidly; the weather became fine, and the skies cloudless. It surprised me that what before was desert and gloomy should now bloom with the most beautiful flowers and verdure. My senses were gratified and refreshed by a thousand scents of delight, and a thousand sights of beauty." 6. "A beautiful morning is not a guarantee for a beautiful afternoon! Just like a man of desert appreciates water, value well whatever beauty you have now!" 7. "Who's to say that it takes something like a drug to mess with your perception of reality? How did Hitler deceive a nation? How can one group of people look at the world and see one thing, and another see something completely different? One sees a town, another sees a desert. One sees beauty, another sees chaos. "The skin of this world," he said quietly." 8. "Who will believe my verse in time to come,If it were fill'd with your most high deserts?Though yet, heaven knows, it is but as a tombWhich hides your life and shows not half your parts.If I could write the beauty of your eyesAnd in fresh numbers number all your graces,The age to come would say 'This poet lies:Such heavenly touches ne'er touch'd earthly faces. 'So should my papers yellow'd with their ageBe scorn'd like old men of less truth than tongue,And your true rights be term'd a poet's rageAnd stretched metre of an antique song: But were some child of yours alive that time, You should live twice; in it and in my rhyme." Logic is a net to catch a „fish" with. And the Truth is like water that can not be caught with net"